FREE with any order over $100! My Fly Rod - This is the ultimate fly swatter. At first you think this is just a novelty item and it does look cool, but in fact this is the last fly swatter you will ever buy. We have used these swatters for 4 years and they are still in remarkable shape. No more heads flying off, no more broken handles, or bent wires. Best of all no more flies! Made with a real graphite rod, just like a fly fishing pole with ultra comfortable grip. Oversize head, you can't miss! 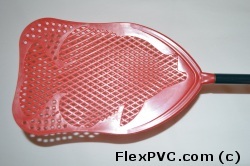 If your order does not meet the minimum or you want to specify color or you just want to buy extras (makes a great gift) you can buy the Fishing Rod Fly Swatters here.